Yesterday you said “tomorrow” !!! Wish you felt more energized? Need to lose weight safely and naturally? Whatever your reason to cleanse, you’ll be doing your health a favor. An internal cleanse is like hitting the reset button on your health and wellness. JuiceForce® specializes in RAW JUICES, detox and weight loss programs with proprietary blends of 100% organic juices, and recipes that are both delicious and work. Between 3lb – 5lb of pure SUPERFOOD in a 500ml bottle! Each day we are exposed to thousands of toxins. Chemicals and contaminants can be found in the air we breathe, the water we drink and the food we eat. These toxins can provide a real challenge for our body’s built-in detoxification system. The good news is that you can rely on JuiceForce® “internal cleansing programs” to revitalize your body. 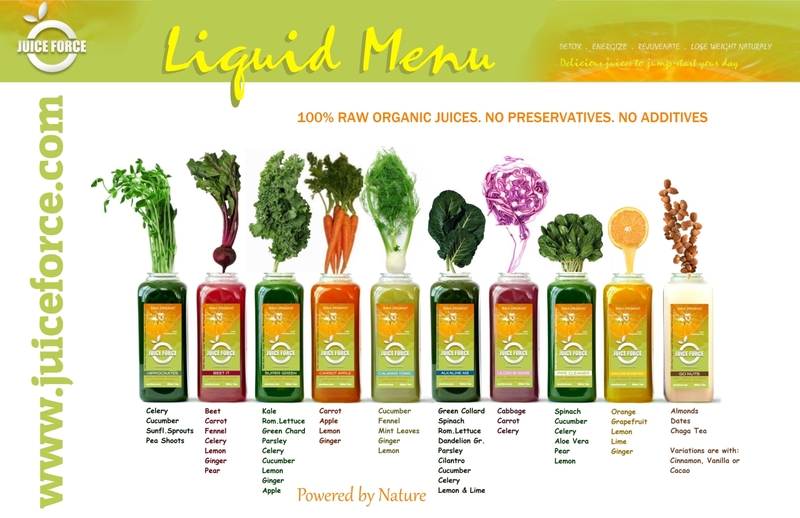 Each juice blend within our detox programs has been carefully selected for maximum results. Your supply of raw organic juices is prepared daily and can be either picked up or delivered to your local health food store for your convenient pick up. Please view our Locations page for service availability in your area. Juice Force is quickly becoming a recognized brand for its quality, expertise, uniqueness and effectiveness of its proprietary raw juice recipes. Our goal is to promote healthier living through doing what we do best …juicing! often and you always do a good job articulating the whatever topic you’re blogging about.